← Should Senator Lindsey Graham call Jeff Bauman for help? Bad Blood in San Diego City Ambulance Services. This was achieved through a heavy-duty, behind the scenes cloak and dagger crew well versed in politics. Emergency commerce entered the arena when the city decided to “outsource” medical services from its fire helicopter services. It’s a double tax, but hey, it’s not as if San Diego doesn’t have a long history of duping voters into voting for people who support business at their expense. 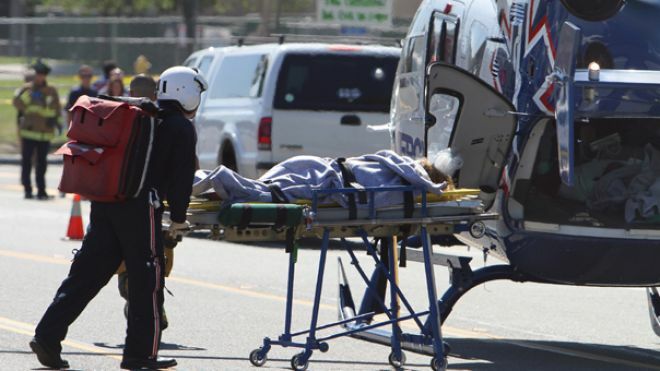 But seemingly seconds later, when a crazed Brendan O’Rourke starting shooting at school kids in Carlsbad, all media shot film of a “Lifeflight” holding a little girl with a non-critical, arm wound. Not a single reporter questioned who summoned the helicopter for non-life threatening services, or, who paid for the service. After awhile people begin to take these things personally. Especially after San Diego Director of Emergency Service, Dr. Bruce Haynes hired former deputy Jesse Thrush, a convicted felon, as an EMT. Thrush had been convicted of killing his girlfriend’s daughter, a toddler with Downs Syndrome. But he applied for the job and was certified after his release from prison, and Dr. First-Do-No-Harm, Bruce Haynes thought, “Dead kid: hey, No problem” and hired him. San Diego City Council reaction? Bumpkiss. San Diego Mayor? Silent as a tomb. It would be good if San Diego residents realized San Diego officials take money very seriously. If would be good if San Diego residents felt comfort when an ambulance arrived. Should San Diego officials ever elect to take emergency medical concerns seriously enough to clean up this area, perhaps they will. Now that the option for new bids for “emergency services” is open, the public awaits. Business as usual, or change for the better? This entry was posted in Politics and tagged emergency medical services, EMT's, outsourcing, San Diego. Bookmark the permalink.